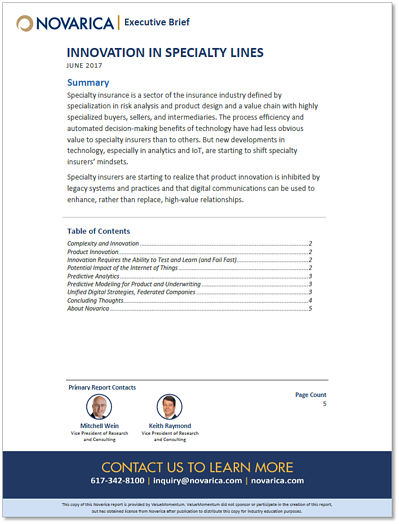 The Novarica Executive Brief discusses the impact of recent technology innovations on specialty insurers. The report is based on Novarica's conversations with specialty insurer CIOs and Novarica's observations. Specialty insurers offer insurance policies to highly specialized buyers, sellers, and intermediaries. New developments in technology, especially in analytics and IoT, are starting to shift specialty insurers’ mindsets. Specialty insurers are starting to realize that product innovation is inhibited by legacy systems and practices and that digital communications can be used to enhance, rather than replace, high-value relationships.